The new Samsung flagship family, announced during the first Unpacked event in 2019, has just come into the hands of users and the race for customization has already begun. After the fantastic backgrounds created ad-hoc to hide the holes in the displays containing the front cameras, this new app will allow you to take advantage of the unique feature of the Galaxy S10. The hole in the display of Galaxy S10 has divided users. Some are thankful for not having to look at a display with a horrible notch and then there are those who just cannot accept the solution chosen by the Koreans. As much as you can discuss the merits and flaws of a hole in the display, it seems that passionate developers have welcomed the feature with open arms and have already begun to look for new creative ways to exploit it in their favor. 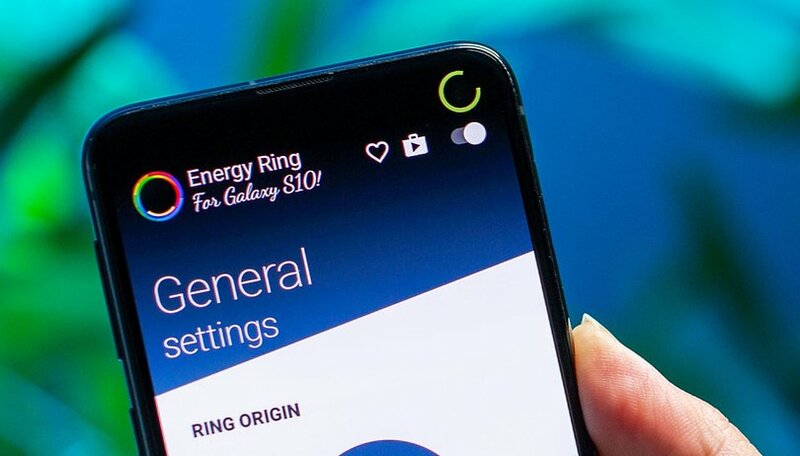 This is what Energy Ring, the new application created by the developer IJP (famous among other things for its Energy Bar app), proposes, which aims to customize your new Galaxy S10 by adding a nice colored ring to the front camera. The ring created by Energy Ring, fully customizable in thickness and colors, indicates the percentage of battery remaining of your new smartphone so as to be always visible at a glance. You can, of course, hide the ring in full-screen applications so that it does not overlap content such as games or videos, just as it automatically hides the status bar in Android. We must admit that the final effect is really convincing and makes its mark, we look forward to some developer developing new features to take advantage of the screen area around the front camera. Unfortunately, it is not yet possible to use the function as a notification LED and the Galaxy S10+ is not yet officially supported. However, the developer states that a version dedicated to the 'pill-shaped hole' display is under development. Have you received your Galaxy S10 yet? What do you think about this application?